Dailybuzz.ch: Christian Okoye Calls Out Nigerian President, "What Took So Long To Hunt For 276 Girls"? 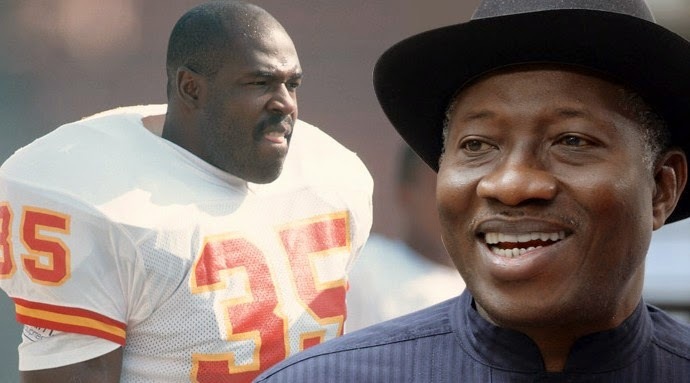 Christian Okoye Calls Out Nigerian President, "What Took So Long To Hunt For 276 Girls"? NFL legend Christian Okoye one of the most famous Nigerian-born athletes of all-time is calling out the President of Nigeria, telling TMZ Sports he FAILED to take immediate action after 276 girls were abducted and it makes him sick. Okoye, who lived in Nigeria until he was 21, says he's been following the terror crisis in his homeland and says it's "very unfortunate that things like this can go on without the world's knowledge." But Okoye has a serious beef with President Goodluck Jonathan who, he claims, did NOTHING when the girls were first abducted by the Boko Haram terror group over a month ago. "It had been almost 4 weeks and [Jonathan] hadn't done anything," Okoye says ... "I'm happy people outside the country got involved because it prompted [him] to finally do something about it." Within the last two weeks, the story went global with some of the most powerful people in the world (including Michelle Obama) raising awareness using the hashtag "#BringBackOurGirls." "The public outcry forced his hand," Okoye says "and it shouldn't have been the reason why he did something." Okoye says part of the problem is the corruption in the Nigerian government, in fact, there are reports Jonathan fired the governor of Nigeria's central bank when he learned the guy was investigating the disappearance of $20 BILLION in the country's oil revenue. "I'm happy people outside the country pushed the President to do something. I hope that the awareness leads to the end of the crisis."